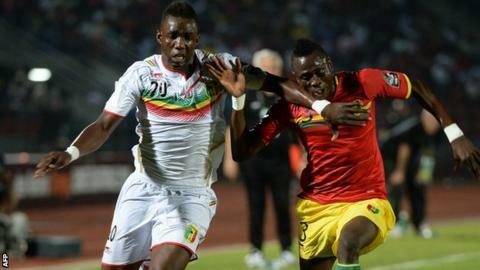 Lots will decide whether Guinea or Mali reach the Africa Cup of Nations quarter-finals after a draw in Mongomo. Modibo Maiga's header from Abdoulay Diaby's cross in the second half left Mali and Guinea with identical records, having drawn each of their games 1-1. The drawing of lots has been postponed until Thursday, having originally been pencilled in for Wednesday evening. Guinea had taken the lead when Kevin Constant coolly dinked home a penalty given for handball by Salif Coulibaly. Mali should have levelled immediately but Seydou Keita's penalty was saved, after Baissama Sankoh was penalised for handball. However, neither side was able to find a winning goal on an uneven pitch. How will they draw lots? The all-important draw will now happen in the Confederation of African Football (Caf) hotel in Malobo at 15:00 GMT, during a meeting of the competition's organising committee. The names of the two teams will be placed into two balls, before an official is invited to pick one ball - inside which will be the name of the team that has qualified for the quarter finals as group runners-up and will face Ghana on Sunday afternoon. The last time lots were drawn to decide a team's qualification in this tournament was in 1988 when Algeria profited at Ivory Coast's expense. Ivory Coast finished top of Group D after beating Cameroon 1-0 - the only match in the group not to finish in a 1-1 draw. Indeed, a 1-1 draw between the Elephants and Cameroon would have left all four teams having to draw lots. Mario Rossi: There surely has to be a better way to settle a group then drawing lots. Wouldn't a penalty shoot-out be a better solution? Sam British: Go to a replay, and if it's still a draw after normal time, go to extra time, and if it's still a draw, go to penalties. Jake Vincent: All 11 players on each team do thumb war - uneven number of players means first team to six wins goes through! Dustin Esinhart: Put it on a pin wheel and spin the needle, whoever it lands on wins. Match ends, Guinea 1, Mali 1. Second Half ends, Guinea 1, Mali 1. Delay in match Abdoulaye Cissé (Guinea) because of an injury. Abdoulaye Cissé (Guinea) wins a free kick in the defensive half. Foul by Bakary Sako (Mali). Attempt blocked. Sambou Yatabaré (Mali) right footed shot from outside the box is blocked. Assisted by Bakary Sako. Foul by Seydouba Soumah (Guinea). Abdou Traoré (Mali) wins a free kick on the right wing. Substitution, Mali. Abdou Traoré replaces Mamoutou N'Diaye because of an injury. Delay in match Mamoutou N'Diaye (Mali) because of an injury. Hand ball by Sambou Yatabaré (Mali). Attempt blocked. Seydouba Soumah (Guinea) right footed shot from outside the box is blocked. Mohamed Yattara (Guinea) wins a free kick on the left wing. Substitution, Mali. Sambou Yatabaré replaces Mustapha Yatabaré. Substitution, Guinea. Razzagui replaces Kevin Constant. Attempt blocked. Seydou Keita (Mali) left footed shot from outside the box is blocked. Foul by Naby Keita (Guinea). Modibo Maiga (Mali) wins a free kick in the attacking half. Foul by Boubacar Fofana (Guinea). Seydou Keita (Mali) wins a free kick on the right wing. Boubacar Fofana (Guinea) wins a free kick in the defensive half. Attempt missed. Molla Wague (Mali) header from the centre of the box is close, but misses to the left. Assisted by Seydou Keita with a cross following a set piece situation. Corner, Mali. Conceded by Abdoulaye Cissé. Foul by Fodé Camara (Guinea). Seydou Keita (Mali) wins a free kick in the defensive half. Substitution, Mali. Bakary Sako replaces Abdoulaye Diaby. Fodé Camara (Guinea) wins a free kick in the defensive half. Foul by Mohamed Yattara (Guinea). Salif Coulibaly (Mali) wins a free kick in the defensive half. Abdoulaye Diaby (Mali) is shown the yellow card. Seydouba Soumah (Guinea) wins a free kick in the defensive half. Foul by Abdoulaye Diaby (Mali). Offside, Mali. Modibo Maiga tries a through ball, but Abdoulaye Diaby is caught offside.